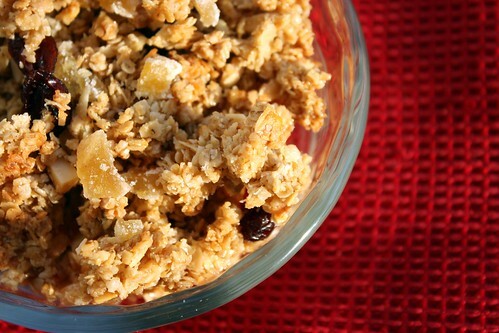 Cranberry Ginger Granola - Eat. Sleep. Vegan. Rich and I eat a lot of granola. I end up buying a large bag of Nature’s Path granola every two weeks, if not more often. So about a week ago I decided I should probably start making granola instead of buying it all the time. Back in February Rich and I went to Montreal to hang out with some old friends and be a bit touristy. While there, we ate at Crudessence twice, and I picked up their cookbook. Originally I’d planned to make one of their granola recipes, but well, it’s hard to make granola in a dehydrator when you don’t own a dehydrator (imagine that!). So I took their Cranberry Ginger granola recipe as inspiration and ran with the flavour idea. Then I realized Jae Steele has a similar granola in her book, Get it Ripe. Those two recipes, plus one from David Lebovitz, were the inspiration behind the final product I ended up with. Get gluten-free oats and oat bran if you want to make this 100% gluten-free. As written, it is already vegan. Preheat oven to 300C. Lightly oil two cookie sheets. Combine all ingredients except the ginger and cranberries. Mix well to make sure the oil and brown rice syrup are well distributed throughout the granola. Spread the mixture onto your cookie sheets; you want a pretty thin layer so it will cook evenly and crisp up nicely. Bake in your preheated oven for 35-45 minutes, stirring once or twice during the baking process. Stirring makes sure everything browns evenly, however, you don’t want to stir it too much or you won’t get the lovely clumps of granola that Rich loves. Once your oats are a lovely golden brown, remove from the oven and let cool for 10 minutes, then stir in your ginger and cranberries. Allow to cool completely, then store in an airtight container. Properly stored, this should keep about a month. That is, if you don’t eat it all before then.